Slavko Avsenik is the World Wide King of Polka Music with over 1,000 songs written! 2 CD box set with 50 songs! 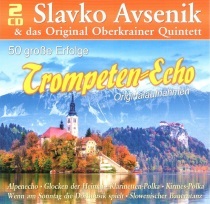 Slavko Avsenik is truly the world’s king of polka music. He has composed over 1,000 songs and this double CD set is just brief look at his wonderful music! This is Slavko Avsenik und seine Original Oberkrainer direct from Europe. Don’t pass this wonderful 2 CD set of music! 9. Die Post geht ab!